Yes, America's greatest road trip drive follows an Interstate. I hear the screams already. "An interstate? Across 300 miles of Godforsaken prairie? Yes indeed. A great road trip needs more than scenery. If that's all you want, drive around southern Utah for a week. A great road trip needs more than roadside attractions: the Smoky Mountains have more, and tackier, tourist traps. A great road trip requires anticipation. 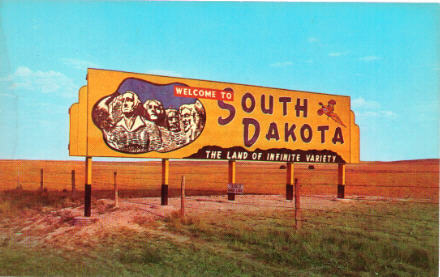 Nobody builds anticipation better than South Dakota, where billboards herald attractions that are still 300 miles away. In fact, nobody builds billboards better than South Dakotans, whose attitude toward billboard control laws was best demonstrated when Bill Hustead of Wall Drug became chairman of the state legislature's transportation committee. South Dakota spent years challenging anti-billboard laws, arguing (in the words of a South Dakota federal judge) that "much of South Dakota is unattractive and that billboards contributed to safety, since they gave drivers something to look at while driving through boring landscape." And they were right. Without the billboards, South Dakota is Nebraska with less corn. On to highlights of the South Dakota roadside!